Satellite Amazonas - Universe Galaxies And Stars Section. A Russian Proton rocket lifted off from the Baikonur Cosmodrome on Wednesday, carrying a Brazilian Amazonas satellite into orbit. The rocket launched at 2232 UTC (6:32 pm EDT), and its Breeze M upper stage placed the satellite into a geosynchronous transfer orbit 9 hours, 11 minutes later. When it reaches its final position of 61-degrees West, it will provide broadcast television services to countries on both sides of the Atlantic Ocean. A Proton rocket launched by International Launch Services (ILS) successfully carried the Amazonas satellite into orbit today. The 191-foot-tall (58.2-meters) vehicle lifted off at 4:32 a.m. from Baikonur (6:32 p.m. EDT Wednesday, 22:32 GMT Wednesday). The rocket’s Breeze M upper stage placed the satellite into a transfer orbit 9 hours and 11 minutes later. The launch vehicle was built by Khrunichev State Research and Production Space Center of Moscow, a partner in the ILS joint venture along with Lockheed Martin Corp. [NYSE:LMT]. 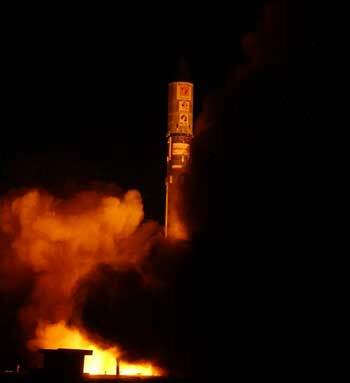 This was the third Proton launch of the year for ILS, and the seventh mission overall for the company in 2004. The satellite was built for Hispasat of Spain, and will be used by its subsidiaries Hispamar of Brazil and Hispasat Canarias to provide a multitude of communications services at both C- and Ku-band on both sides of the Atlantic Ocean. When it reaches its operating position of 61 degrees West longitude, the Amazonas satellite will be the largest in the Hispasat fleet. The high-power satellite is a Eurostar E3000 model built by EADS Astrium of Europe, the third E3000 spacecraft launched by ILS this year. "We thank Hispasat for again selecting an ILS vehicle," said ILS President Mark Albrecht. "We have demonstrated that Hispasat can rely on us for a good launch, whether they choose Proton, or whether they choose Atlas as they have twice before." Albrecht added that the Proton vehicle has now completed five missions this year, three for ILS and two for the Russian government. "We call this the workhorse of the Russian fleet, because it flies so often and so reliably. Everyone from start-up businesses to telecommunications giants to participants in the International Space Station have put their trust in Proton," he said. "ILS is proud to market this vehicle for commercial satellite launches." "This is a major milestone for EADS Astrium, with Amazonas being the third Eurostar E3000 version satellite to be launched this year by a Proton Breeze M launcher from ILS," said Antoine Bouvier, CEO of EADS Astrium. "Amazonas is the most powerful satellite ordered by Hispasat. The satellite was delivered in time, which was very important. This satellite is equipped with a new lithium-ion battery offering higher efficiency. All our teams in Europe were mobilized to make this event a success." ILS has established itself as the indisputable launch services leader by offering the industry's two best launch systems: Proton and the Lockheed Martin-built Atlas. With a remarkable launch rate of 65 missions since 2000, the Atlas and Proton launch vehicles have consistently demonstrated the reliability and flexibility that have made them the vehicles of choice. Since the beginning of 2003, ILS has signed more new commercial contracts than all its competitors combined. ILS was formed in 1995, and is based in McLean, Va., a suburb of Washington, D.C.
Go To Original Article From Universe Galaxies And Stars.